First Bank offers the perfect low-rate card. 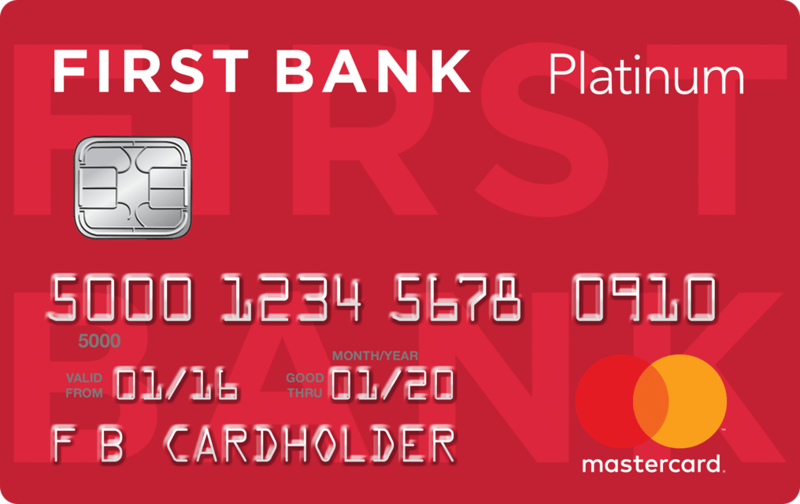 The First Bank Platinum Credit Card is just the right card for those who want to keep it simple. Use it for your everyday and monthly purchases, all at a great rate. This feature assists you with credit bureau notification and credit card replacement, and provides you with an ID Theft Affidavit should you become the victim of identity theft. You have 26 days when you're not charged interest for purchases you've made, so long as you pay your balance in full on time. Most manufacturer's warranties are doubled up to one year when you pay with your eligible MasterCard®. ©2017 MasterCard. MasterCard, Debit MasterCard and the MasterCard brand marks are trademarks of MasterCard International Incorporated. 0% introductory APR for the first 6 months for new cardholders.After 6 months, a variable 11.40 - 21.40% APR will apply. See our Disclosure Summary for complete details on rates and fees. Calculate your savings with the Balance Transfer Calculator. *0% Introductory APR is only available to customers who become new card holders after September 15, 2014. Credit applications are subject to credit approval.